There is something for everyone in this fun book of puzzles and activities, no matter what your age or level of experience. 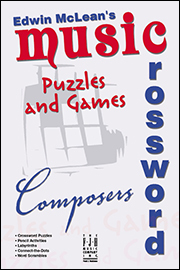 The puzzles progress from very easy to advanced, and included at the back of the book is an extensive reference section which consists of signs and abbreviations, terms, composer listings, and foreign language terms. Students will quickly discover that even if there is a term or foreign word they don’t know, finding the answer is as easy as flipping to the back of the book. As a teacher, this book will make a wonderful gift to students, and help make learning fun! During the hectic holiday season it is helpful to have an activity that is enjoyable, entertaining, and provides a chance for some quiet time. 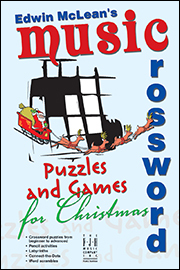 Edwin McLean's Music Crossword Puzzles and Games for Christmas provides easy puzzles and games with more "pencil" activities for the younger students. This book includes a list of all the carols and songs used in the puzzle clues as well as reference pages for terms, abbreviations and signs, and composers - everything needed to solve these puzzles. Makes a terrific stocking stuffer for students of all ages! 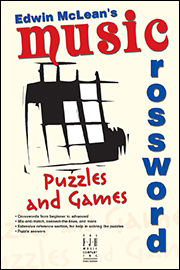 This book if full of enjoyable and educational easy to advanced puzzles and activities featuring famous composers. Included are crossword puzzles, pencil activities, labyrinths, connect-the-dots, and word scrambles that provide more than enough variety for students to learn as they have fun! This book is great for teachers to have handy in their studio for students to use while waiting for their lesson, or to give as a holiday and recital gift.